Today, we’re celebrating the culmination of over a year’s work on the part of a number of people. 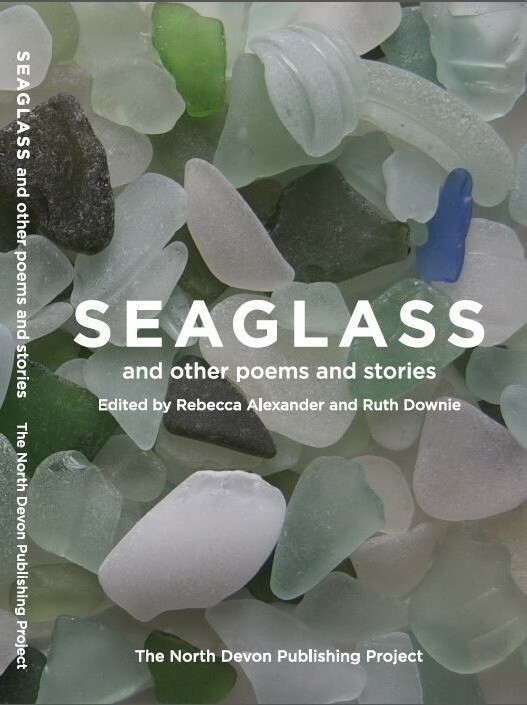 Two hundred and six poems, flash fictions, memoir, short stories and a song have been put forward to judges, read, enjoyed, mulled over and eventually whittled down to an anthology: Seaglass. It’s available for £5.99 from Lulu here and will soon be available from Amazon etc. It’s a lovely collection of work, from gorgeous flash fiction surprises to landscape poems, moving memoir and all kinds of stories. During the process I have met many writers, and will meet more at the launch tonight. I’ve also seen the generosity of writers in helping other people work on their entries in writing groups, giving their time and energy to support creative writing in North Devon. My special thanks go out to Vicky at Laughing Gull Design for the lovely cover, Sue and Colin Smith for their work collating and ordering the first draft of the anthology, Colin again for his professional proofreading and editing, Michelle Woollacott for her work publicising the book including getting us a spot on the local radio and blogging interviews with the writers, Jude Jeal at the library who has supported, promoted and encouraged writers through the provision of writing groups at Barnstaple Library and beyond, Gillian Kerr who has done so much to build the Work in Progress group at the library, which is such a melting pot of ideas and work, and Ruth Downie, who took time out of her own writing to read the entries and feed back her impressions of each one to help us select the most suitable. If you would like to see how the anthology turned out, find out what North Devon writers have been up to and listen to some lovely stories and poetry, we invite you to the Boston Tea Party, Barnstaple, at 7pm to help launch the collection. There will be readings and a chance to meet many of the local writers. Tickets are available on the door for £3 per person. In making the anthology, we had to leave more than half the entries out. That’s the hard bit. Sometimes the entries were too similar, we had to choose the one that fitted the anthology better. One stunning piece was just too long, some didn’t fit with the size of the book. We just ran out of room at the end. But we captured the best bits, pinned them down, edited a few commas and typos, and they look lovely. Maybe the rejected pieces will be polished and edited and find a publishing home in a competition or another anthology. Well done everyone. 1 Response to Reflecting on a great year – Seaglass, the anthology! Congratulations to everyone! Sorry can’t be with you tonight for the launch, but will ensure I get a copy. Enjoy the well-earned celebrations. And how auspicious to bring it to the public on National Poetry Day. Hurrah!